A leader in the trucking industry, IMC Companies has an insider’s view of opportunities for improvements and efficiencies in the transportation process, the value of which only a seasoned, industry veteran could understand. IMC Companies provides more complete supply chain solutions to their cargo owner customers. If weather or disasters or breakdowns threaten to delay a critical shipment, you have an early warning. Rest assured, however – with our network resources and expedited service expertise, we can help work out the best alternative to get what you need where you need it. IMC Companies is focused exclusively on increasing efficiencies in the logistics processes of our clients. As an asset-based logistics provider, we can leverage our national network of trucking transport and support businesses to ensure optimal results, eliminating waste from your supply chain model. We tie our NVOCC, customs brokerage, and truck brokerage services together to provide a quality comprehensive product that is transparent to you, the customer. We provide global customer solutions through integrated transportation resources. 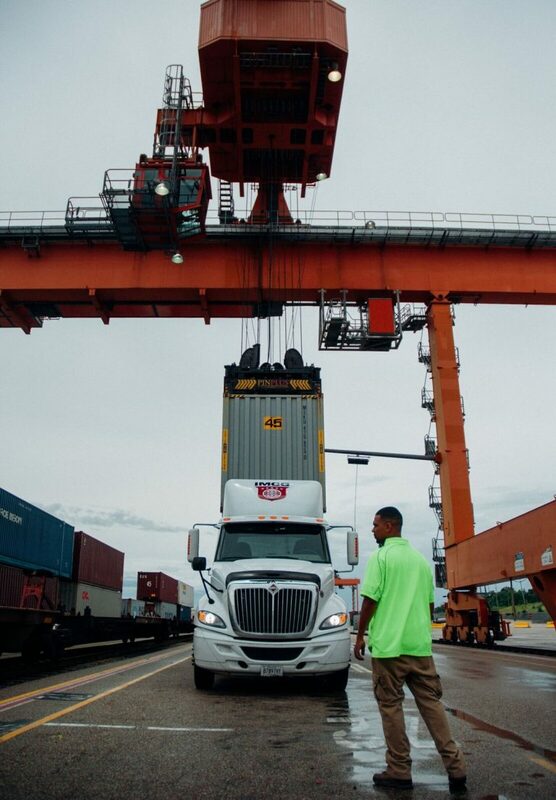 We pride ourselves in being able to exceed your expectations by leveraging our expertise in intermodal logistics, our relationships and our own assets. Regardless of where your cargo is, or where it is headed, as a national company with local expertise, we can help create the right logistics plan to meet your specific needs. At IMC Companies, we custom design each supply chain solution to address our clients’ goals, all while meeting their budget and deadlines. We offer the most beneficial and timely delivery of your cargo to its ultimate destination safely. Solutions that exceed your expectations. Plus, since visibility and transparency are key elements to a successful supply chain, we offer real-time access to the location and ETA of your cargo at any point in your PO transit. This includes satellite GPS tracking requirements from 100% of our motor carriers. We look forward to designing a supply chain solution that exceeds your expectations. TIME-SENSITIVE SHIPMENTS, WE CAN HELP. Simply, we find efficiencies in supply chains that can benefit you. We propose a solution to the ever-challenging capacity dilemma by focusing on equipment utilization, technology and visibility to serve our customers.